The probe features very low drift (less than 1% RH in 5 years) eliminating the need for 6 or 12 month calibrations. RH Accuracy is ±3% RH from 0 to 95% RH. The probe's internal temperature sensor provides a total system accuracy of ±0.15°C for temperatures between 0 and 40°C and ±0.3°C at -25°C and 85°C. Moisture data from the TRH-100 Probe can be read as Relative Humidity (%RH), Dew Point, or Wet Bulb temperature. The TRH-100 Temperature and Relative Humidity Probe is available in four cable lengths, from 1 foot to 50 ft (0.3 to 15 meters). Either data logger also connects to a variety of precision sensors, including Pressure, Temperature, AC Current, AC Voltage, DC Current, DC Voltage, Light and more, plus resistances, other DC voltage ranges, and contact closures. 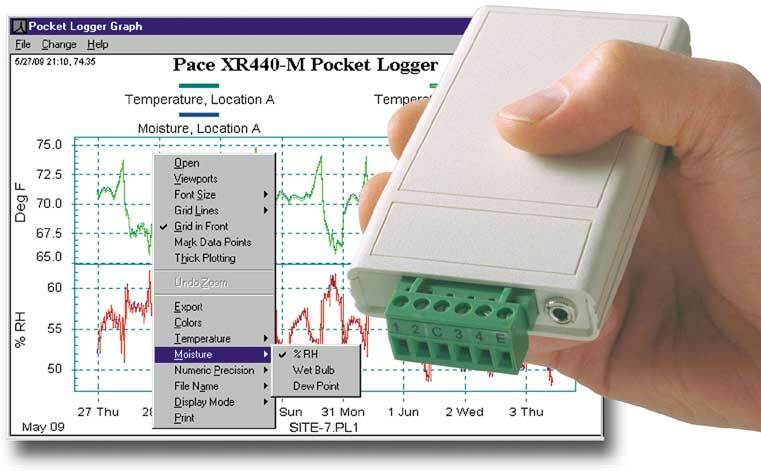 Pace Data Loggers and connected sensors require no connection to a computer or external power. XR440 and XR5 Software (both free) include a real time "Strip Chart" graph display, to trend readings in real time while the data logger is simultaneously recording data. XR440 and XR5 Data Files can open directly in Excel. With the XR5-SE Data Logger, high or low "alarm" levels may be entered for any channel. If "Log on Alarms" is selected, readings are logged only when a pre-set level is exceeded. 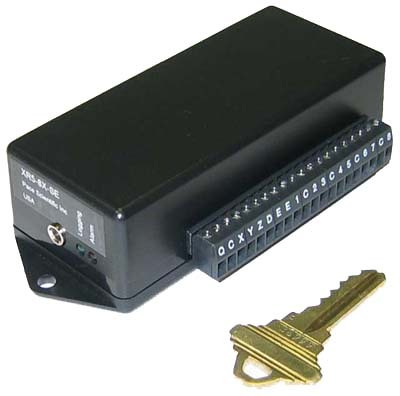 Communicate to a Pace Data Logger without wires. The WTP-100 Wireless Link enables wireless communication from your computer to a Pace Data Logger. Pace Data Loggers will log readings for over 3 years for typical logging setups. Recorded data is preserved if battery power is lost. Provide protection from outdoor and hostile environments: XR5 Cases XR440 Cases. Contact Pace to discuss your logging application. © 1996-2017 Pace Scientific Inc. All rights reserved.